There are some 30 types of cabs in Singapore, in at least eight different colours, across seven brands. If that is not enough to make commuters dizzy, there are close to 10 different flagdown fares, three different metered fare structures, more than 10 different types of surcharges, and eight types of phone booking charges. Mix and match each of these types of charges to the various types of taxis and you will get combinations that rival the Rubik's Cube in complexity. Marketing professional and regular taxi customer Lau Sau Kuen probably echoed the sentiment of other commuters when she said: "It's terrible we have so many types of cabs and so many different rates. I don't know the rates any more. Just as I don't know the different surcharges any more. I'm resigned to paying whatever the cabby tells me to at the end of a ride." And if locals like Ms Lau find it confusing, what chance do visitors have? It does not help one bit that operators are now allowed to adjust fares at will. So, even if you managed to memorise the dizzying permutations of fares, you would need to be eagle-eyed to spot the perpetual changes. How did Singapore come to this state? Well, it started in 1998, when taxi fares were deregulated. The Land Transport Authority said then that the move was to allow taxi companies "to set fare structures based on their assessments of prevailing market conditions". If that argument is sound, why don't we allow bus and train operators to do likewise? Why are there two fundamentally different policies for taxis and other forms of public transport? This approach does not stand up to scrutiny - unless taxis are not viewed as public transport in the first place. Here, the authorities are rather inconsistent. Taxis are considered public transport when it comes to the tallying of public transport ridership numbers. Operators are given special dispensation when it comes to Certificate of Entitlement bidding, and granted bigger tax rebates than private car buyers are if they choose environmentally friendlier models. But elsewhere, they are deemed private transport. Operators enjoy a laissez-faire environment no different from that of car rental companies (in fact, they operate like car rental companies), free to set whatever rates they choose. This became more apparent when the Government liberalised the industry in 2002, a move that saw several new players entering the fray. The move resulted in a more competitive market that proved beneficial to cabbies in terms of more employment choices and attractive terms, but left a question mark over service standards - despite an almost 50 per cent surge in cab population from 2002 to last year. With about 28,000 taxis on the road, Singapore has a higher cab-to-resident ratio than most developed cities. Despite that, frequent complaints of "can't get a cab when you need one" recur. To be fair, it would be tough to get a cab anywhere in the world sometimes, such as on Saturday nights and rainy days. But macro figures suggest that taxi usage here is less than optimal. Hong Kong's 18,000 taxis make about one million trips per day. Singapore's 28,000 cabs do slightly under a million trips. On fares, Hong Kong also seems to have a more efficient system. Its cab fares are government-regulated. The market is tightly controlled too, with no new taxi licence issued since 1994. Taxis are instantly recognisable, with three basic colour schemes (red being the most prevalent). The fare structure is a lot less complex. The flagdown rate is a uniform HK$20 (S$3.20), with every 200m or one minute of waiting time charged at HK$1.50. Surcharges are few and low. For instance, phone booking is HK$5 (S$0.80), but many taxi operators will waive this. A 10km cab ride in Hong Kong costs slightly more than a ride in a normal taxi in Singapore without surcharges and booking. But with surcharges or booking, the ride here costs more - with one in a newer or fancier cab being even more expensive. Costs aside, commuters in Hong Kong seem better served than those in Singapore, as many visitors will attest. In Singapore, the Government recently put in place new measures to force taxi operators to improve service levels, especially in taxi availability, for example by imposing a minimum mileage a day. Whether that will work remains to be seen, but at least one taxi company - Premier - is reacting in a somewhat perverse way to regulations. It has jacked up its peak-hour booking charge to $4.50, compared with $3.30 charged by most others. It did so ostensibly to manage demand. 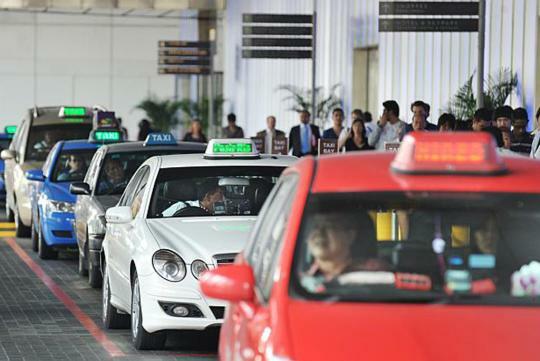 With fewer people dialling for its cabs because of the revised charges, observers said Premier will be better able to meet the Land Transport Authority's (LTA) requirement for taxi operators to dispatch cabs to at least 92per cent of the people who call in. As for the mind-boggling fare structure that vexes commuters, the LTA says that companies are required to publish fare changes. Publishing fares is of no help when there are so many rates to remember. And because of the exigent nature of transport, consumers are less in a position to pick and choose taxis even if they recall rates - unlike the situation they face when shopping for groceries or going for a haircut. Is it then time for the Government to re-regulate fares and the industry? Indeed, it must. If it considers taxis as public transport. I'm glad I don't take cabs or need to rely on them to get around.